After a raucous night of karaoke with my travel blogging brethren, it was time to catch up with an old friend I hadn't seen since 1) he got married, and 2) I left on my trip around the world. I took a taxi over to my friend Kai's apartment, and there was the man, Chris, who had dared me to cage dive with Great White sharks off the coast of South Africa. It was great to see him again. Due to rain, we headed for a nearby restaurant called 5 Points in the Village. 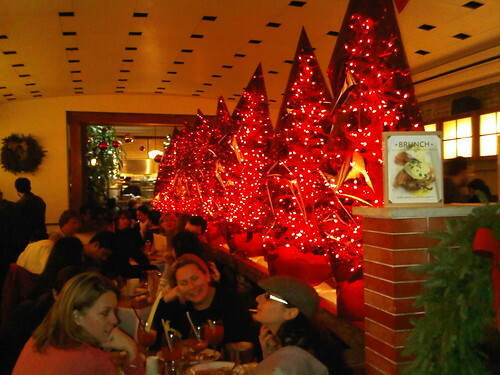 The place was hopping, however we managed to secure a table after only a few minutes of waiting at the bar. I was immediately impressed with the kosher salt they offered on the table. It's my salt of choice, and a rare find on a restaurant table. 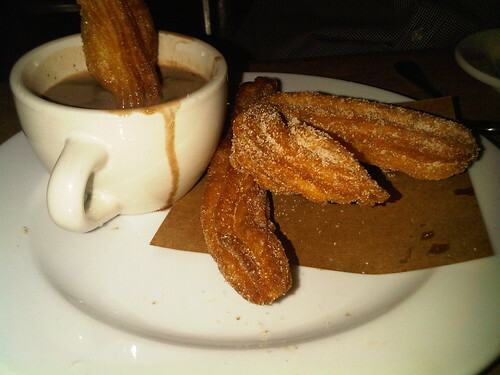 The service by our waiter was excellent, and in no time, we were chowing down on sugary churros, dipped in hot chocolate. The sweet pastries reminded me of the ones I sampled in Barcelona at the start of the year. We continued to catch up…and then it arrived. 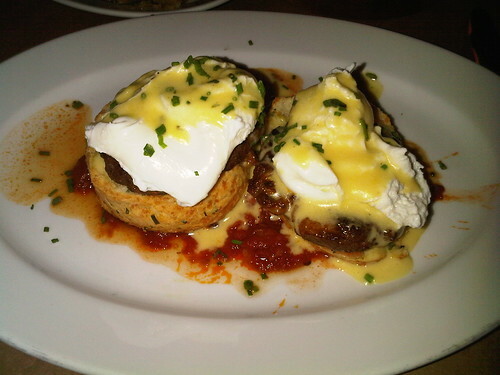 Possibly the most delectable brunch dish I've had since discovering Eggs Benedict a long, long time ago. Words won't do it justice. Nor does the $14 price tag. It was rich and decadent. The fennel-flavored sausage was unlike any other I'd tasted, and the biscuit held up well against all the moisture from the egg and tomato sauce. 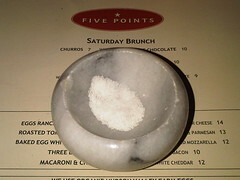 5 Points gets five stars in my book for ambiance, service, and quality of food. Five Points sounds like a most next time I'm in NYC. The whole food blog thing caught my attention after getting back from my travels, and I do love to take photos of a great meal and share them. The trouble I have is with describing it all. Like wine, it requires a certain degree of detail, and creative use of adjectives! I try so hard not to always use the same words, such as delicious, great, tasty, and so on. Perhaps a blog with just food photos is up my alley!